Getting your pooch into dog agility competitions can be a great way for you and your pet to bond and exercise together. Agility dogs are hard-working, sporty, and very attentive to what their owners want them to do, and with this sport, communication is key. Why Start in Dog Agility Competitions? Canine agility competitions is a perfect way to entertain you and keep your Fido active, both physically and mentally. If you think the breed you have can't go through the agility courses you've seen before, you're likely mistaken. All dogs – big, small, short and tall – can excel at agility training and competitions, according to canine agility expert Graham Taylor who gave an interview to The Telegraph (source). Dog agility training and competitions is a fairly recent sport which began in England, in 1978 with AKC holding their first competition for canine athletes in 1994. Today, the doggy sport has grown immensely with an average 9% annual popularity growth. If you're looking to get into the field, now is the right time to start training. Because communication between the handle and the animal is key when it comes to agility training, dogs learn that their owner is worth listening to, and they genuinely want to do well to impress their human. There are a few things you must know before getting started with dog agility competitions to decide whether it's for you or not. For some general FAQs on dog agility training and competitions, The Kennel Club has a great page answering most of the questions of dog owners and handlers that have already started training and possibly even went to their very first competition. Are there any health risks and potential injuries involved with agility training and competitions? Both of these are crucial to ask and find answers to, and since there's not enough information out there, this article will look at some what do vets, dog trainers and science says about the pros and cons of this dog agility sport, its risks and what are possible injuries for canines, and of course where does one start with dog agility competitions should they choose to give it a try at all. The main advantage is that participating in dog agility competitions will solve behavior problems caused by boredom, apathy, depression and other canine mental disorders by giving your pup a job. When dogs feel like they have a purpose they stop acting out to focus on the task at hand (or paw, rather). Studies have demonstrated how agility training specifically exercises not only your dog’s body but also his mind, and mental stimulation is crucial for dogs' overall health. Because your pooch has to think on his feet and follow commands in a split second, this sport is sure to keep your dog interested, focused and well-stimulated. Dog handlers also get a lot of exercise. Agility is very physically demanding on both the dog and the handler, so the two of you need to be healthy enough to run the course. 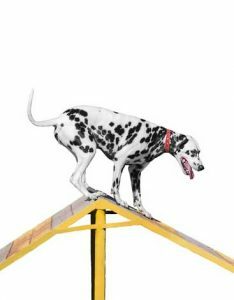 Before starting agility you should talk to your veterinarian to make sure your dog does not have any structural problems that can be exacerbated by the agility. It is particularly demanding on the joints. While Border Collies are the most common and generally the breed that does the best in competition out of all dog agility popular breeds, any other dog breed can still participate and win awards. Note that some associations will not let mutts compete but others do. Agility demands your dog to follow commands and interpret them into an action. Thus it will make all aspects of your dog’s training better. Because agility is run by a handler instructing a dog without a leash, this sport greatly improves the dog’s off-leash reliability. When training with a dog that you are not comfortable with being off leash, make sure any off leash activities are done in a fenced area. Even if you're not thinking about getting into dog agility competitions seriously, agility tricks themselves can be a really fun thing to show off to your friends, especially if they are not familiar with it (and beneficial for the Fido). I've trained many dogs for agility, but more pet owners choose to avoid competitions themselves. And if dog agility competitions are not your thing either, that's perfectly fine and it's not essential to reap the benefits of this sport for the dog or the owner. Many people do agility training with their dog and never compete. In fact, you can buy dog agility kits to set up right in your own backyard, no matter how small of a space you have, and get yourself and your pooch working. Some kits can be costly, but others run anywhere from $50 to $100 and are fairly affordable to start training your dog at home. Good question, and yes – there are risks involved. Just like with almost any other sport or activity out there, owners and their pets have to be careful with the practice and be aware of all potential dangers that activity involves. Dog agility competitions is no different, and the more you practice, the more likely your dog may get injured. In fact, several studies and surveys have found that certain dogs may be at risk of injuries that are directly related to dog agility competitions. A paper on kinetics of jump landing in agility dogs (study) found that certain agility obstacles are riskier for dogs than others. Another survey-based research paper on injuries (study) among dogs competing in agility competitions found the same thing. From this, we can easily see that prevention of risk factors, and learning and educating yourself on what can go wrong during canine agility competitions is the best way to approach these events and training for them. Are certain breeds are more prone to injuries during dog agility competitions than others? It's possible. For example, this retrospective survey of injuries related to canine agility (study) have found that Border Collies may be at higher risk of getting injured. The paper also mentions specific dog agility obstacles that are more dangerous to Collies than others. In terms of more injuries, another research paper on epidemiology of injury among handles and their dogs (study) found that not only does dog agility competitions pose certain risks for canines, but this practice may also put dog owners and handles at risk as well. The above study conclusion doesn't apply to every dog owner and/or every dog, but it does bring up a lot of good points that pet owners and handlers should pay attention to, such as which exercise need to be prepared for better (study) and which ones it's best to avoid for specific dogs. Finally, an internet-based survey from AVMA has some good statistics in terms of injuries related to dog agility training and competitions which I recommend anybody to take a look at before embarking on this venture. It's important to be aware of this data. When weighing the results of the above and other studies, as well as advice from experienced professional dog trainers and veterinarians, it's not surprising that dog agility competitions increase the risk of injuries in dogs. This applies to pretty much any competition sport under the sky (except for, maybe, golf). With the above considered, should owners avoid canine agility training and competitions? Not at all. Dog agility training and competitions is a great way to exercise the dog and stregthen the bond between the handler and his/her animal. However, due to all the risks of injuries, this type of training must be taken very seriously. Remember that certain breeds are simply not good for dog agility competitions. Some dogs may have genetically predisposed diseases or disabilities that increase the risk of injuries when doing dog agility training. And above all, it's best to educate yourself well on this type of training first before attempting your first try. After the risks of injuries are considered, the other downside of dog agility competitions is that they can be very expensive. Agility training classes and trial fees can rack up quickly. But don’t be discouraged, because there are ways to get around some of the monetary demands. You can train your dog at home by yourself. There are a lot of youtube videos that can help you with training, and all of the equipment can easily be made at home. You could also take a few beginner courses and then once you have the hang of it, train at home. Getting started in agility is actually very easy. Because it has gained so much popularity, there are classes and trainers in almost every city. Get connected with a group or trainer so that you can learn (at the very least) the basics. It is nice to be part of a group because the other members can support you. There are also local clubs you can become a part of as well, which many dog trainers and veterinarians recommend for pet owners. It's beneficial to both you and your Fido for many reasons, no least of which is strengthening the bond between you two as well as keeping your dog active, exercised and in top shape. Your dog must be at least 18 months old to compete, and this is a good thing. Puppies are still developing their bones, so doing high jumps can cause them to have problems that can scar them for life. If your pooch doesn't qualify yet, there are plenty of other dog-friendly sports to get into. When training a puppy for agility, to start with, simply lay the bar on the ground and have them step over it. For small dogs they are usually ready for jumping at a year old, but for big dogs can take anywhere from 18 months to two years to fully develop. Check with your vet to see if your dog is ready for jumps. Your Fido should also be well socialized, because there are bound to be distractions and he will be off leash. He should be friendly to both people and other dogs. When starting out there are some things you will have to learn about your dog, yourself, and the dog agility competitions you go to. First, you will need to find out what motivates your dog. Is it healthy dog treats? Tennis balls? This is how you will be motivating him to follow your commands and do the work. However, these items cannot be used while competing, only for training. Figure out which way you are most comfortable handling your dog. Which hand are you going to use to direct the dog? Which side of you will he be on? Then learn the rules for each specific club or organization. They all have different rules, so pay attention to which competition you are at and what can disqualify you. Lastly, set goals for what you want to achieve. Are you going to be fully committed to competing or just do it occasionally. Early training is great, but go easy on your puppy. The best age for an agility dog is between the ages of 4 and 6, but everyone is welcome. Don’t underestimate the positioning of the course. It may look easy in walk through, but the courses are set up to be challenging. Don’t just memorize it. You need to analyze the course and plan how you are going to run it. Make good contacts. This can help you to make connections that could lead you to getting better training, better equipment, and can help you to be successful. Agility should always be fun for both dog and owner, so keep it fun. Have lots of positive reinforcement and enjoy the time you are spending together. Don’t get impatient when your dog doesn’t do something correctly. It will take time for him to learn all of the new information. Above all else the health and welfare of the animal is the most important. Don't push him to train too hard. He doesn’t need it. A few training sessions a week, whether in class or at home, is enough.